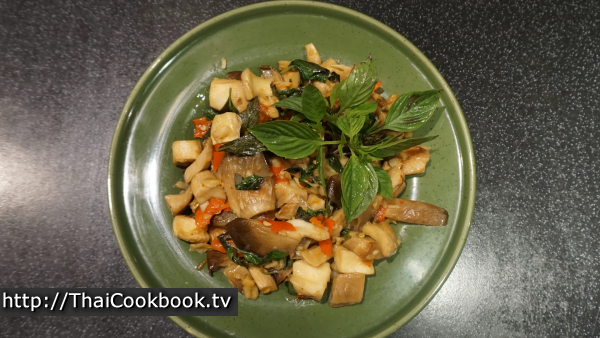 For this recipe we selected some large oyster mushrooms, but any type of mushroom will produce this lovely Thai stir-fried dish. It's quite simple to make with just a few ingredients and less than 10 minutes of your time. We like to use an extra dose of garlic and hot chili for a very spicy plate of delicious mushrooms, but you can use less and it still comes out great. 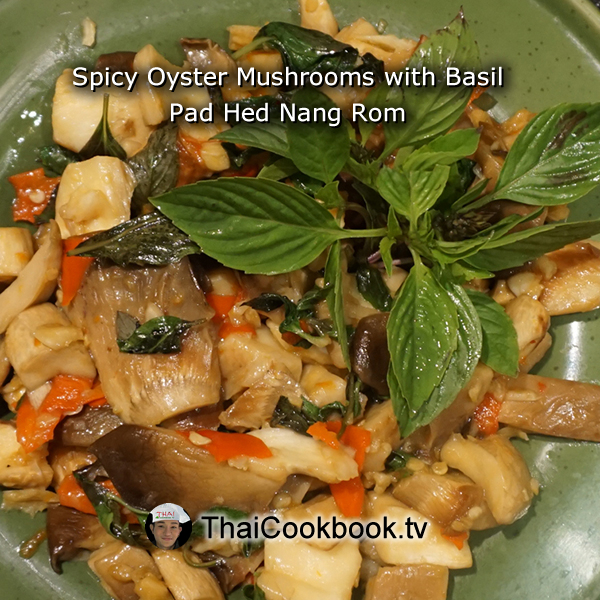 What's in our Spicy Oyster Mushrooms with Sweet Basil. 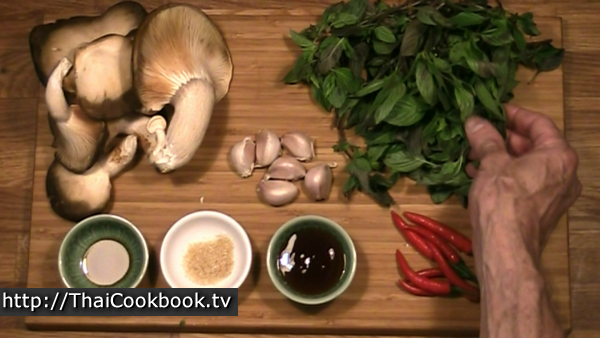 How we make our Spicy Oyster Mushrooms with Sweet Basil. 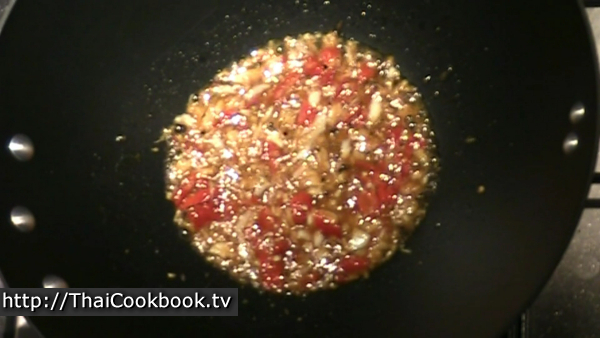 1) Fry the chopped garlic and chili in a little oil until fragrant, then add oyster sauce, soy sauce, and sugar. Fry together until smooth. 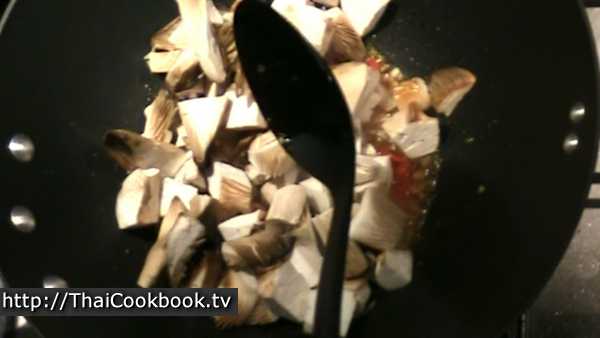 2) Add the cut mushrooms with a little water and fry until softened. 3) Turn off the heat and toss together with fresh basil. 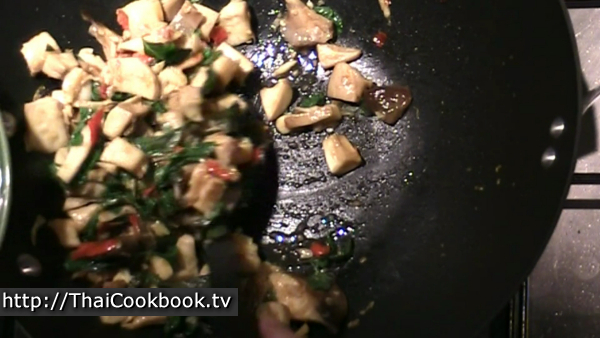 4) Serve with steamed rice or as part of a meal. Garnish with fresh basil tops. These are some nice big oyster mushrooms that I found at the market here. 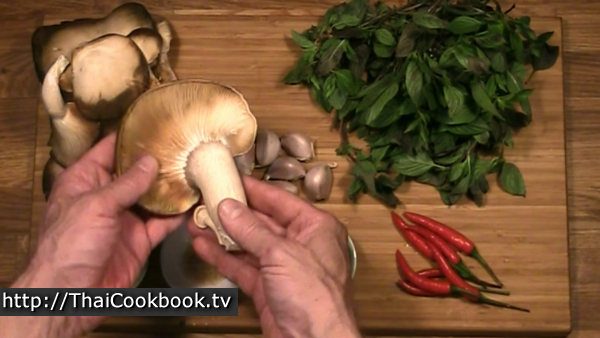 You can use any other type of mushroom that you can easily get. Try to get big ones so you can cut it into irregular sizes. 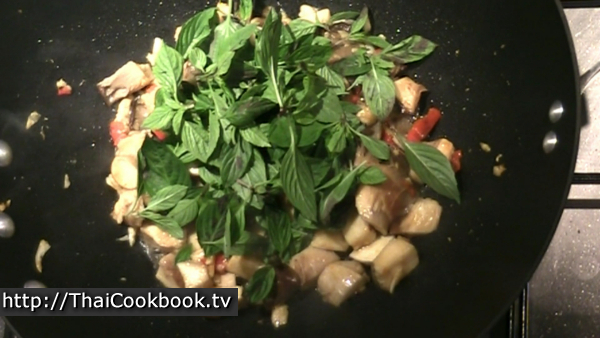 I use Thai Sweet Basil, the one often called Star of Siam. In Thailand we call it Horapah, and it has a delicious aroma and flavor like licorice. Start by cutting your mushrooms into chunky bite-sized pieces. Because these are so large, I usually do it in irregular sizes so you can tell that it's mushroom. If you use something like Shitake mushroom, then just cut in half will be good. Roughly grind the garlic and chili using a mortar and pestle so you have big irregular pieces. This is a very spicy dish, so if you're planning to feed any cry-babies you can always use less chili. Heat one tablespoon of oil in a wok or big frying pan over low heat, add the garlic and chili and fry it slowly for about a minute so it doesn't burn. 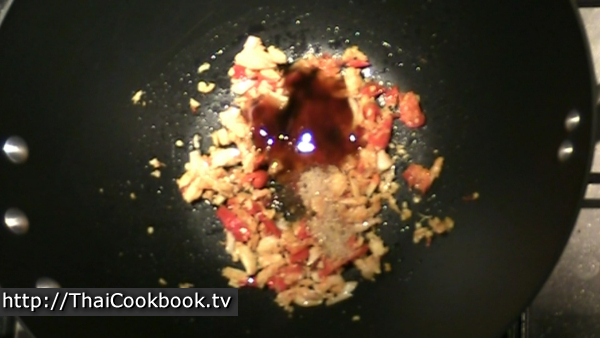 Add the oyster sauce, soy sauce, and sugar and stir it all up well. Fry it together until the sugar melts and the sauce is hot and bubbly. 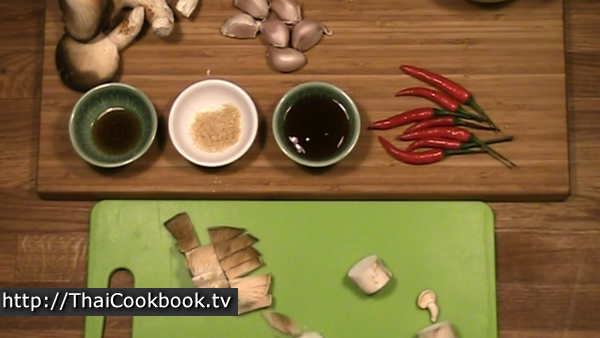 Add the mushrooms and stir them into the chili and garlic oil until they are even coated. The pan will be a little dry, so keep stirring and keep the heat low. Cook for about 2 minutes. 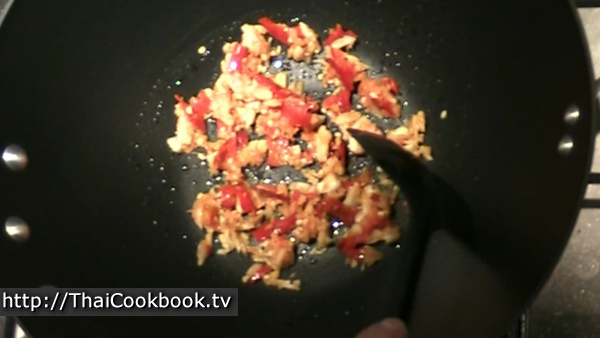 When the pan is really dry and it looks like it might burn, add just a little water and stir it in well. 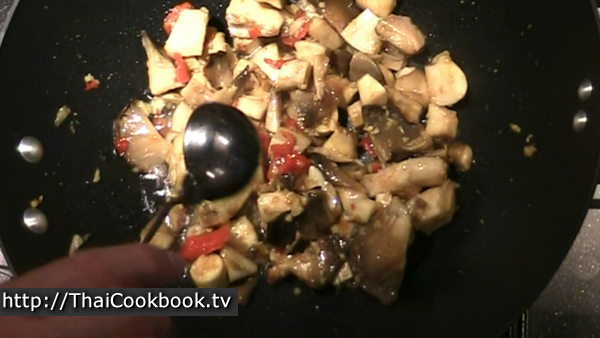 Continue store frying for about 2 more minutes, or until the mushroom are softened. you want to have just a little sauce, so add a few drops of water as need while cooking. Turn the heat off, add the basil, and toss it together while the pan cools. 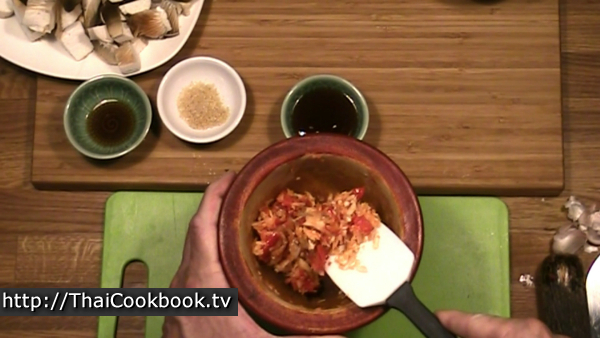 Serve immediate with steamed rice for a nice lunch, or as part of a meal with other foods. Arrange the ingredients so it all looks nice, and garnish with fresh basil tops.